LEGO Batman! Prince of Persia! The Last Blade! Curling! If Nintendo had announced this week's downloadable titles during their E3 2012 press conferences, maybe we wouldn't all be trudging around like sad puppies today. I mean check out that lineup! You've got the original platforming action hero, an SNK arcade classic, a sport that Canadians really enjoy, and Batman! And that's just the tip of the iceberg, really. I didn't even mention the cat puzzle game or the Art of Balance! And hey, there's a new Dinosaur Office video from the College Humor folks. Between that and tons of Nintendo E3 videos, your 3DS might be the one to watch this weekend. Bring tissues. 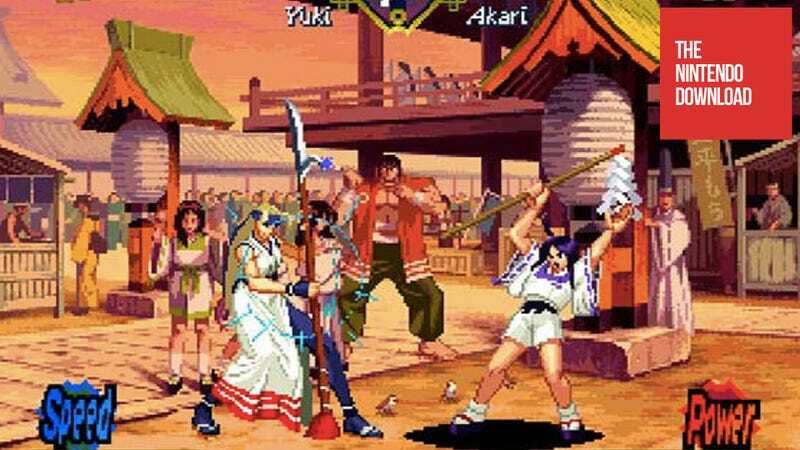 Originally released in 1997, The Last Blade is a fighting game set in the "Bakumatsu" period of Japanese history, where 10-plus swordsmen are fighting for different purposes. The game is similar to its predecessors from the Samurai Showdown series released by the same company, but it differs in allowing players to choose between two sword types; the damage-focused "Power" or "Speed," which promotes speedy play. Other game elements include maneuvers like "Repel," which allows players to deflect enemy attacks, and "Sublime Slash," which cancels "Super Slice" and can be combined with "Super Secret Slice." Don't miss out on powerful -moves like "Super Secret Slice" and "Hidden Secret Slice." Curling is the world famous sport in which players slide stones across a sheet of ice toward a target area, the "house". Two teams, each of four players, take turns sliding heavy stones, also called "rocks". You can also challenge your friends to a multiplayer game to show everyone who the best player is! This adorable and relaxing puzzle introduces totally new twists to the popular slide and match-3 mechanics and, of course, lots of cats. Slide rows or columns of cute, cuddly cats until you create a chain of three or more cats of the same kind to pull them out of the well. The game features a Mission and Quick-play mode with a combined 140 levels and an explanation of all the rules in a quick tutorial. The Mission mode provides new challenging objectives in each level, such as: clear the board with only one slide, pull out all the shining cats, make a six-cat chain reaction. You need to accomplish the objective in order to advance to the next level. The Quick-play mode is all about beating your high score, and there are no restrictions on how to play. Just remember that longer chains can trigger funny bonuses and score you more points. The game will engage you in hours of blasting fun, even if you are not a cat person! Play one of gaming's most loved platformers. The classic Prince of Persia is now available for download. Relive this classic platforming experience, often heralded as a pioneer of the platforming genre. This re-release is faithful to the original, complete with the dashing acrobatics of the Prince that made the game famous. Traverse sprawling levels, dodge deadly traps such as spikes and guillotines, and clash swords with palace guards – all before facing the evil Grand Vizier and rescuing the princess. But be quick: you only have one hour. The sands of time are flowing…. Grab your stylus and build a balanced stack in this physics-based puzzler! Puzzle games must be addictive. This was our top priority during the development of the game. That's why we designed 200 levels that not only challenge your skills but also your imagination. With its perfect touch controls Art of Balance TOUCH! is easy to pick up and hard to put away. Seeking a real challenge? Then try out the new endurance mode and drive your score ever higher. Art of Balance TOUCH! brings the ultimate "just one more puzzle" experience to your Nintendo 3DS. Batman and Robin return in LEGO Batman 2: DC Super Heroes, the highly-anticipated sequel to LEGO Batman: The Videogame. This time the Dynamic Duo join forces with other famous DC super heroes including Superman, Wonder Woman and Green Lantern to stop the notorious villains Lex Luthor and The Joker from destroying Gotham City. Kids can be such a mouthful.